Conditioned medium from HPAECs contains an eosinophil survival factor. A, Effect of HPAEC-CM on eosinophil apoptosis. Eosinophils (5 × 106/ml) were incubated in Iscove’s DMEM alone (control), IL-5 (10 ng/ml), GM-CSF (10 ng/ml), or with HPAEC-CM. Eosinophils were harvested at 24 h, and apoptosis was assessed morphologically. Data represent the mean ± SEM of three independent experiments, each performed in triplicate (∗, p < 0.05 compared with control values). B, Morphology of eosinophils cultured in HPAEC-CM. Photomicrographs (original magnification, ×400 magnification) of cytospin preparations. Eosinophils were incubated in Iscove’s DMEM alone, HPAEC-CM, or unconditioned medium containing IL-5 (10 ng/ml) or GM-CSF (10 ng/ml). Eosinophils were harvested at 24 h. Examples of apoptotic eosinophils are indicated with closed arrows. C, Effect of HPAEC-CM on eosinophil apoptosis (FACS analysis). Eosinophils were incubated in Iscove’s DMEM alone, HPAEC-CM, or unconditioned medium containing IL-5 (10 ng/ml) or GM-CSF (10 ng/ml). Cells were harvested at 24 h, and apoptosis was assessed by flow cytometry using FITC-labeled human Annexin V and PI. Histograms showing Annexin V binding are from one experiment representative of two others. Specificity of HPAEC-CM-induced eosinophil survival effect. A, Effect of HUVEC-CM on eosinophil apoptosis. 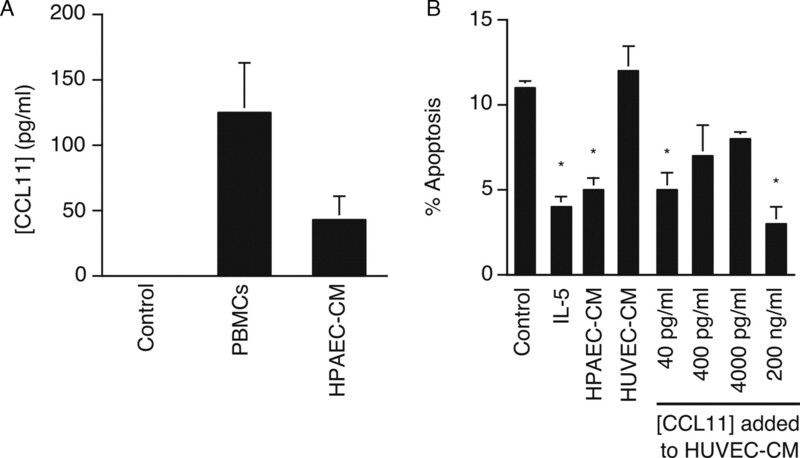 Eosinophils were incubated with IL-5 (10 ng/ml), HPAEC-CM, and HUVEC-CM. Apoptosis was assessed morphologically. Data represent the mean ± SEM of three independent experiments (∗, p < 0.05 compared with control values). B, Effect of HCAEC-CM and HAEC-CM on eosinophil apoptosis. Eosinophils were incubated in HAEC-CM or HCAEC-CM. Apoptosis was assessed morphologically. Data represent the mean ± SEM of three independent experiments, each performed in duplicate (∗, p < 0.05 compared with control values). C, Effect of eosinophil-endothelial cell contact on eosinophil apoptosis. HPAECs, HUVECs, HAECs, and HCAECs were grown to confluence, and the medium was replaced with serum-free Iscove’s DMEM with or without eosinophils (2.5 × 105 eosinophils per well). Eosinophils were harvested at 24 h, and apoptosis was assessed by FACS analysis. Data represent the mean ± SEM of three independent experiments (∗, p < 0.05 compared with control values). 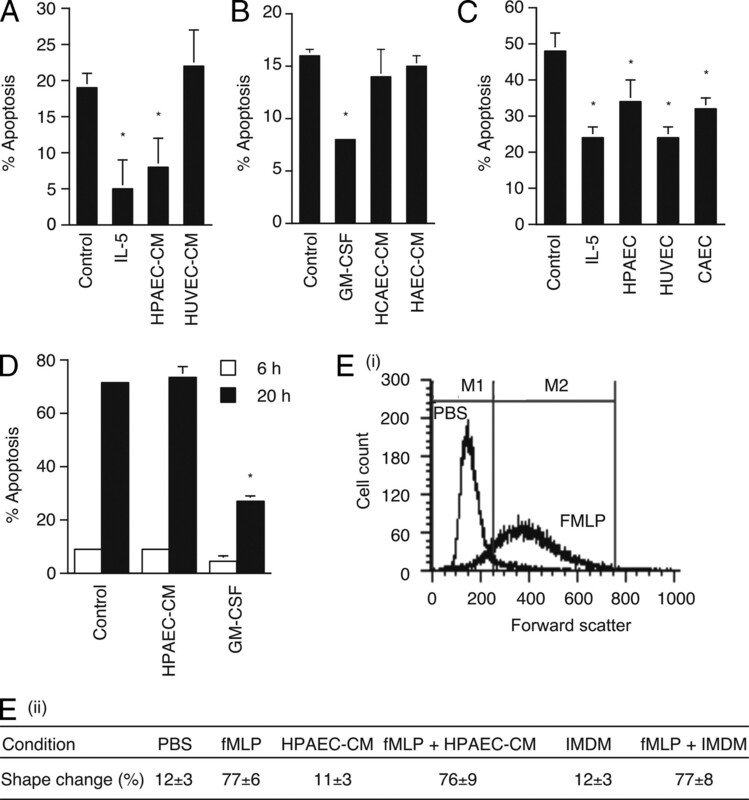 D, Effect of HPAEC-CM on constitutive neutrophil apoptosis. Neutrophils (5 × 106/ml) were incubated in Iscove’s DMEM alone, with GM-CSF (10 ng/ml) or HPAEC-CM. Neutrophils were harvested at 6 h (□) and at 20 h (▪). Apoptosis was assessed morphologically. Data represent the mean ± SEM of three independent experiments, each performed in triplicate (∗, p < 0.05 compared with control values). E, Effect of HPAEC-CM on neutrophil shape change. Neutrophils (5 × 106/ml) were incubated for 10 min, and shape change was assessed as described in Materials and Methods. i, Histogram showing the effect of PBS alone or fMLP (1 μM) on neutrophil shape change from one experiment (representative of two others). ii, Effect of PBS, fMLP (1 μM), HPAEC-CM, fMLP plus HPAEC-CM, IMDM (Iscove’s DMEM), and fMLP plus IMDM on neutrophil shape change. Percentage shape change was calculated based on the percentage of cells in the M2 gate. Data represent the mean ± SEM of three independent experiments, each performed in triplicate. Time-dependent generation and protein nature of HPAEC-CM survival effect. A, Effect of different dilutions of HPAEC-CM on eosinophil apoptosis. Eosinophils were incubated in Iscove’s DMEM alone (control), IL-5 (10 ng/ml), HPAEC-CM (1/1), or HPAEC-CM diluted 1/3, 1/10, or 1/30 with Iscove’s DMEM. Eosinophils were harvested at 24 h, and apoptosis was assessed morphologically. Data represent the mean ± SEM of three independent experiments, each performed in duplicate (∗, p < 0.05; ∗∗, p < 0.01 compared with control values). 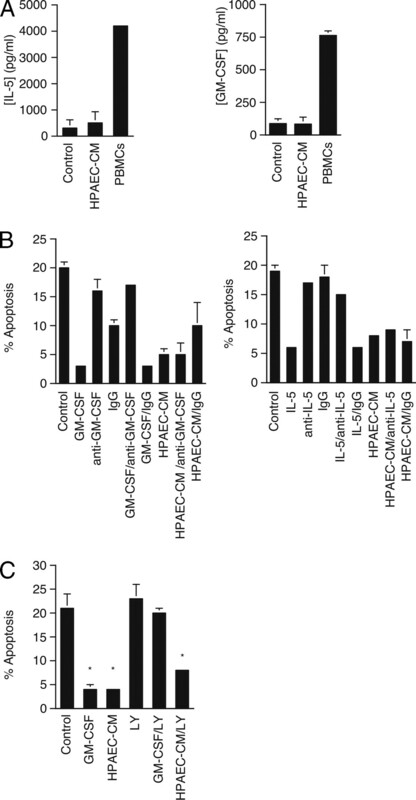 B, Effect of HPAEC culture period on the HPAEC-CM-induced survival effect. Eosinophils were incubated with DMEM alone (control), or HPAEC-CM removed following 3, 6, 9, or 15 h of contact with HPAECs. Eosinophils were harvested at 24 h, and apoptosis was assessed morphologically. Data represent the mean ± SEM of three independent experiments, each performed in duplicate (∗, p < 0.05 compared with control values). C, The effect of trypsin digestion on HPAEC-CM-induced eosinophil survival. Iscove’s DMEM with soya bean trypsin inhibitor (SBTI) alone or with trypsin plus SBTI, HPAEC-CM with SBTI alone or with trypsin plus SBTI were digested as described in Materials and Methods. Eosinophils were harvested at 24 h, and apoptosis was assessed morphologically. Data represent the mean ± SEM from three separate experiments (∗, p < 0.05 compared with HPAEC-CM values). D, The effect of heat inactivation on HPAEC-CM-induced eosinophil survival. Eosinophils were incubated in Iscove’s DMEM alone (control), HPAEC-CM, or their heat-inactivated equivalents. DMEM and HPAEC-CM were inactivated by heating at 56°C for 45 min. Data represent the mean ± SEM from three independent experiments (∗, p < 0.05 compared with control values). 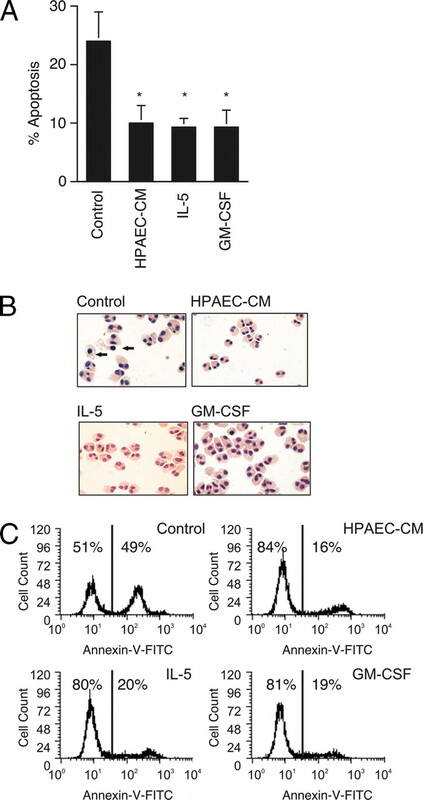 HPAEC-CM-induced eosinophil survival effect is not mediated by IL-5 or GM-CSF. A, ELISA measurement of GM-CSF and IL-5 in HPAEC-CM. As a positive control, PHA-stimulated PBMCs were used. Data represent the mean ± SEM of three independent experiments. B, The effect of GM-CSF and IL-5 neutralizing Abs on HPAEC-CM-induced eosinophil survival. Iscove’s DMEM alone (control), GM-CSF (10 ng/ml), anti-GM-CSF (50 μg/ml), GM-CSF (10 ng/ml) plus anti-GM-CSF (50 μg/ml), or with IgG (50 μg/ml) were incubated for 1 h at 37°C before resuspension with eosinophils. HPAEC-CM alone, with anti-GM-CSF (50 μg/ml), or with IgG (50 μg/ml) was also incubated for 1 h at 37°C before resuspension with eosinophils. Anti-IL-5 was also used as described for GM-CSF and at 50 μg/ml. Eosinophils were harvested at 24 h, and apoptosis was assessed morphologically. Data represent the mean ± SD of two independent experiments. C, Effect of LY294002 on HPAEC-CM-induced eosinophil survival. Eosinophils were preincubated with or without LY294002 (1 μM) for 15 min before resuspension in Iscove’s DMEM alone (control), GM-CSF (10 ng/ml), HPAEC-CM alone, LY294002, GM-CSF plus LY294002, or HPAEC-CM plus LY294002. Eosinophils were harvested at 24 h, and apoptosis was assessed morphologically. Data represent the mean ± SEM of three independent experiments, each performed in triplicate (∗, p < 0.05 compared with control values). HPAEC-CM-derived eosinophil survival factor is a CCR3 agonist. A, Representative chemokine membrane array film showing HPAEC-CM. Grid references A1, B1, and L4 represent the internal positive controls, and the circled spots represent CCL11 (K1) and IL-8 (I2). B, Densitometry analysis of chemokine arrays with grid references. Data represent the mean ± SEM of three independent experiments (∗, p < 0.05 compared with HUVEC-CM values). The mean values were calculated as a percentage of the positive controls (A1 and B1). C, Effect of GW782415 on HPAEC-CM-induced eosinophil survival. Iscove’s DMEM alone (control), GM-CSF (10 ng/ml), GW782415 (10 μM), or with GM-CSF plus GW782415 (10 μM) were incubated for 30 min at 37°C before resuspension with eosinophils. HPAEC-CM alone, with GW782415 (10 μM), or with its diluent (10 μM DMSO) was also incubated for 30 min at 37°C before resuspension with eosinophils. Eosinophils were harvested at 24 h, and apoptosis was assessed morphologically. Data represent the mean ± SEM of four independent experiments (∗, p < 0.01 compared with HPAEC-CM values). D, The effect of M3 on HPAEC-CM-induced eosinophil survival. Iscove’s DMEM (control), GM-CSF (10 ng/ml), M3 (1 μg/ml), CrmE (1 μg/ml), GM-CSF plus M3 (1 μg/ml), or with GM-CSF plus CrmE (1 μg/ml) were incubated for 1 h at 37°C before resuspension with eosinophils. HPAEC-CM alone, with M3 (1 μg/ml), or with CrmE (1 μg/ml) was also incubated for 2 h at room temperature before resuspension with eosinophils. Eosinophils were harvested at 24 h, and apoptosis was assessed morphologically. Data represent the mean ± SD of two independent experiments. Limited availability of M3 precluded additional experimental repeats. Identification of CCL11 as a novel HPAEC-derived product capable of causing survival of human eosinophils. A, The mRNA expression of CCR3 agonists by HPAECs. Quantitative PCR cycle thresholds for CCL5, CTACK, CCL11, CCL24, and CCL26 mRNA. β-Actin mRNA expression was detected as a control. Confluent HPAECs were serum-starved for 15 h as described in Materials and Methods before RNA isolation. Data represent the mean of duplicate samples from a single experiment with the SD values all under 5% of the mean value. B, The effect of CCR3 agonists on eosinophil apoptosis. Eosinophils were incubated in Iscove’s DMEM alone (control), GM-CSF (10 ng/ml), CCL5 (200 ng/ml), CCL27 (10 μg/ml), CCL11 (200 ng/ml), CCL24 (500 ng/ml), and CCL26 (5 μg/ml). Eosinophils were harvested at 24 h, and apoptosis was assessed morphologically. Data represent the mean ± SEM of seven independent experiments, each performed in triplicate (∗, p < 0.05 compared with control values). Values represent mean ± SEM apoptosis values expressed as a percentage of the control value. C, The effect of CCL11 Ab neutralization on the HPAEC-CM-induced eosinophil survival effect. Samples were preincubated with the Ab or isotype-matched IgG controls for 1 h at 37°C before resuspension with eosinophils (5 × 106/ml) as described in Materials and Methods. Values represent mean ± SEM apoptosis values expressed as a percentage of the control value (∗, p < 0.05 compared with HPAEC-CM values). 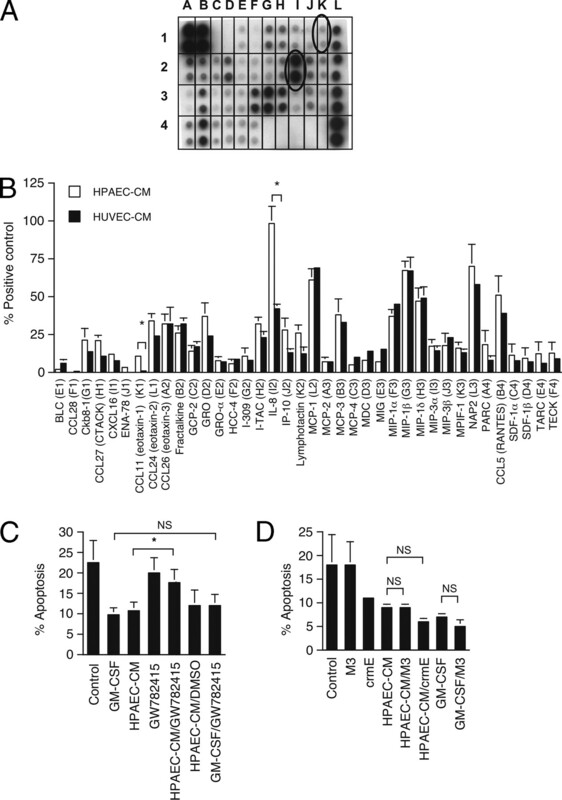 The effect of CCL11 addition to HUVEC-CM in mediating eosinophil apoptosis. A, ELISA measurement of CCL11 in HPAEC-CM. As a positive control, TNF-α-stimulated PBMCs were used. Data represent the mean ± SEM of three independent experiments each performed in duplicate. B, Effect of the addition of CCL11 to HUVEC-CM on eosinophil apoptosis. Eosinophils were incubated in Iscove’s DMEM alone (control), IL-5 (10 ng/ml), HPAEC-CM, HUVEC-CM, or HUVEC-CM containing 40, 400, 4000 pg/ml, or 200 ng/ml CCL11. Eosinophils were harvested at 24 h, and apoptosis was assessed morphologically. Data represent the mean ± SEM of three independent experiments, each performed in triplicate (∗, p < 0.05 compared with control values). b , p < 0.05 compared with HPAEC-CM values). Note that each set of neutralization experiments was conducted separately due to limitations on human eosinophil number.